Pop Chart Lab strikes again. If your home isn’t filled with Pop Chart Lab stuff at this point, we’re not sure what you’re waiting for. The Brooklyn-based graphic design squad has made an art form out of distilling pop-culture topics (Carrie Bradshaw’s shoe collection, the jerseys of the NBA, famous cats) into slick infographics that are equal parts informative and cool-looking. 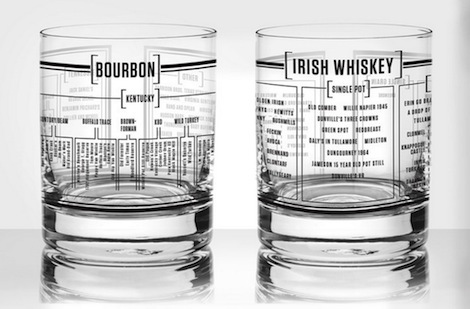 Each 14 oz double old-fashioned tumbler breaks down a major variety of whiskey (Bourbon, Irish, Scotch, and Single Malt Scotch) into its constituent parts and variations, and makes the perfect gift for dram drinkers, snifter savants, and lovers at large of the ultimate amber elixir. Staring at your glass of Four Roses no longer has to be an exercise in existential despair. Instead, you can memorize some useful brown-spirits know-how while you get drunk. Scientists* say it’s the best way to learn. 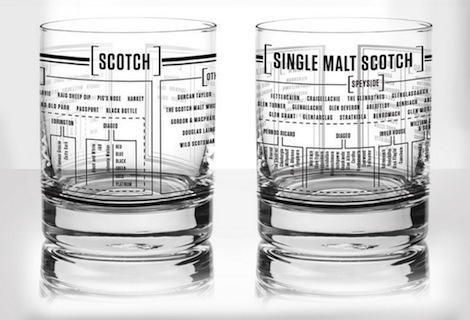 The set of four glasses is $45 and available at popchartlab.com.